In recent days, the nation has been riveted and repulsed by the grand juries’ decisions to indict neither Ferguson police officer Darren Wilson in the death of Michael Brown, nor New York City police officer Daniel Pantaleo in the death of Eric Garner. In the ensuing national conversation, many white people are staring down the stark reality of ongoing systemic racism in the United States for the first time. The inequities exposed by Wilson and Pantaleo’s impunity in Brown and Pantaleo’s respective deaths have served as a rude awakening for countless white people, whose experiences with the U.S. justice system have been nothing like their African-American peers’. This is a crucial goal, and it’s a goal that’s within reach—but families can only achieve it by being intentional in their parenting. For decades, white families have been hesitant to discuss race with their children, fearful that they might misspeak or be misunderstood and inadvertently foster prejudice in their own children. In fact, according to a 2007 study at Vanderbilt University of 18,950 families with kindergarteners, 75 percent of white families never or almost never discuss race with their children. This is a major problem. When white parents don’t discuss race with their children, studies show, peer and media influences fill in the gaps—often with terrible consequences. Children are not colorblind; they begin noticing race at as young as six months of age. Even though they lack racial vocabulary, they quickly begin to categorize people by color—drawing upon the most obvious of stereotypes. “Group of friends smiling.” A photo by hepingting. Licensed under CC BY-SA 2.0. This means it’s important for white parents who wish to raise anti-racist children to begin talking with their kids about race from an early age. Here are a few suggestions, backed by the research in this area, on how white parents can raise children who are allies to people of color and who can think critically about race relations, race representations, and racism. For maximum effect, though, these conversations should be meaningful—not just a brief mention, but a real dialogue that is age-appropriate, according to one study on how children develop prejudice. It’s worth working at. 2. Teach your children to respect other racial groups. I asked Dr. Holden for his expert advice in this area, and he suggested that white parents should also take their children to visit minority-majority neighborhoods and let them experience, firsthand, what it’s like to be “other.” “White parents can take their children to visit an African-American church,” he suggests, “or a Spanish-speaking neighborhood. It helps for children to know what it feels like to be in the minority,” he explains. If you decide to take your children to visit a community that is not predominantly white, the key to success is emphasizing empathy. Make sure that the trips are not about gawking—not about saying, “Wow, look at all those people.” It shouldn’t be a form of tourism, a means to gawk at others or their surroundings. Instead, it should be about respectful perspective-taking—experiencing being in the minority. The goal should be to develop a better understanding of the feelings of people from other backgrounds who are often underrepresented in pop culture and made to feel of lesser value. In so doing, we can cultivate a genuine anti-racist standpoint in our children. 3. Introduce your children to diverse adults. 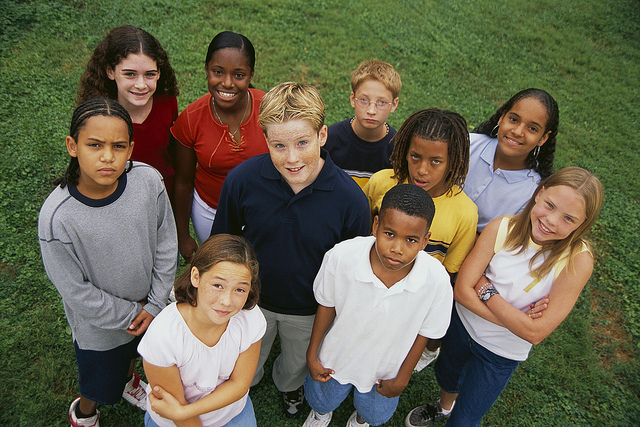 If you have friends outside your own racial or ethnic group–and you should–make sure your kids see this first-hand. If they do, they are likely to perceive people from other races more positively than they would otherwise. In fact, research suggests that knowledge of parents’ friendships is an even better way of reducing racial biases in children than attending diverse preschools. Although studies have shown that interracial friendships and cooperative learning can help reduce children’s biases, doctoral research at the University of Texas at Austin found that children’s mothers’ friendships were the much more influential factor. This can be made sense of by remembering that in the preschool years, parents are the major socializing forces in children’s lives. Our kids want to be just like us—so they’re paying attention to how we actually live our lives. That means we need to pay attention, too, and purposefully expose our children to friends of various backgrounds. 4. Watch media and read books with diverse characters. Children don’t just need to see people like themselves in the media and in books They also need to see positive depictions of people from other racial and ethnic groups. So, seek them out: watch movies and television shows about a range of people. And find books that feature stories about people whose backgrounds differ from your family’s. Make a special effort to find picture books featuring cross-ethnic friendships in particular. (This may be especially important if you live in an area lacking in diversity, where cross-ethnic friendships are not an option for your family.) Researchers have noted that children under the age of 8 are strongly oriented towards their own racial or ethnic group, so seeing a character who looks like them gives them a character to identify with. Then, when they see that character interact with people from different races, the story functions as a source of indirect cross-ethnic contact for the child—with the potential to improve their racial attitudes. Just remember that as you and your children watch television or read books together, you need to be explicit about your own position. Children of this age range are not very good at making inferences about adults’ feelings on race, so as discussed in Tip #1, we have to be clear. 5. Discuss racial and ethnic stereotypes in the media. According to media literacy expert Cyndy Scheibe, when children are about 8 years old, it’s possible to discuss racial and ethnic stereotypes with them. When movies or television programs contain stereotypes, you can explain to older children that those stereotypes are the result of decisions made by real people. When I interviewed her for my book, Scheibe explained that Pocahontas is a good starting point for conversations about how the stereotypes in media are the results of people’s decisions. “To me,” Scheibe says, “Pocahontas is probably the most egregious of all of the Disney Princesses because she was a real person in history, and she could not have had a twelve-inch waist. And she was twelve years old when she met John Smith. She didn’t fall in love with him; she didn’t marry him; she did save his life. But the Disneyfication of her story overlays a really skinny, beautiful princess whose goal is to fall in love. In short, white parents who wish to be allies to people of color should actively model an anti-racist standpoint for their kids. But just modeling isn’t enough—we need to talk openly about our position, too, and call out stereotypes when we see them. By taking these steps, we can raise children who are anti-racist and willing to change our world for the better. I appreciated this post very much- we in Germany learn very very soon, what our history was like. Ask any child from preschool and it will tell you, what the nazis were like and how disgusting they were. My parents never explicitly talked about race with me, they never told me, that every person is equal and has equal rights but they meant it to come naturally. We live in the deepest countryside and everyone not being white- heterosexual and at best male is a bit of a freak to most of the guys living here but I learned very soon, things are different. Just by the way my parents acted and reacted. Even, if you just tell your children and discuss with them about the media, the books and whatever it is still about what you do yourself. Being 16 I know my parents view on the world isn’t affecting mine that much anymore but this basic things, like equality of race, gender or sexual orientations were set in my mind very early. I had a few friends who lived in a home for asylum seekers, because the government thought here in the countryside is a nice place to stay, my first tutor group in primary school was mixed with people from 10 different nationalities. We need to set things in the families but a family can’t fix things forever. it is about the schools, the kindergartens, the primary classes to tell them how to sort out things. The generation growing up with Ferguson will learn much about equality, maybe most of all children raised for now… Sad but true: we need a catastrophe to learn, things have to change…. Because I like to state the obvious, the other thing we need to all do is to *stop them in their tracks and object* when they bring home and mention racist statements or attitudes they’ve learned at school, from other family members or through media – and educate ourselves to do the same for acts of appropriation, like dressing as a member of another race or nation as a “halloween costume”. I also frequently and loudly object to voiced racism from other family members in front of mine, explicity stating things like “I don’t want you teaching your revolting attitudes to my children”, and “never repeat anything you hear [family member x] say” – but I do understand that sort of aggressive behaviour isn’t for everyone (and not every bigoted family member is as amenable to disagreement from their juniors). I think that another issue is the ability to hear another’s story, and to acknowledge their experience (without taking it personally, or thinking its “about you”). In reading the comments of whites on SO MANY sites, even the implication that racism exists; or that they themselves may be inadvertently displaying racist behavior; is met with a complete meltdown and hissy fit. Learning to listen deeply in a time of iPhone, FB, email chatter to another person from a different culture, race, etc. It is also the parents who themselves have some great non-white colleagues, friends and neighbours. I stress that learning about history as part of the school curriculum is important. I have 4 nieces and nephews from 2 sisters who are half-white-Chinese. For the sake of improved future understanding…and allowing these biracial children be comfortable also in their identity. Would the author suggest that minority parents also take their children to “safe” white neighborhoods? Good point, Alana. I’m not sure why Holden framed it that way, but that was his advice based on his research. Now that you point it out, I don’t like that phrasing, and I’m sorry I didn’t catch it sooner. Thank you for bringing it to my attention. contenu semblent être en cours d’exécution hors de l’écran dans Firefox . You seem to be an intelligent person – why then does the implied racism of this article’s title not register with you? Maybe it’s me, maybe I’m a racist but I believe if you dropped the word “white” from the title, you’d appear less prejudiced and more open-minded. Non-white children don’t need to be raised to be allies in the fight against racism, they are living the battle everyday of their lives. It is white children who need to be specifically raised with awareness of these issues, because the reality and existence of racism isn’t a constant presence in their lives. So yes, it is you. and jackknifing are also typical results caused by inattentive and fatigued truckers. Just a thought here, but black underachieving could be due to lower average IQ, not white privilege or structural racism. And, all this anti-white indoctrination and self-flagellation might have something to do with the Trump phenomenon. Just saying…. Wow. You MUST be joking. I can’t recall anything we specifically did to cause her to be that way, though I have always been determined to instill the belief in the equality and value of all races in her, so maybe it came out unconsciously early on. We did send her to one of the very few racially diverse preschools in our area. Before she was born we moved from Orlando, where we had friends of all races, to a 98% white state, so it’s been rare to have non-white friends here, but we do have a few, and one of their sons is a close playmate of our daughter’s, and one of her best friends at school is Nepali. I make sure to read her books about and with ethnically diverse main characters, and books specifically about race issues as well. My mom did this for me and I really appreciated it. True it could have been a neutral comparison, e.g. I just don’t like it because it’s different regardless of HOW it’s different. But she at that time was already aware of race issues and had been having discussions with me about people’s skin color, which is what I attributed it to. But even if her choice was not “noble,” it is still ridiculous that they made P’s skin so much lighter (and other ethnic princesses also), and the point remains that it’s important to teach our children about these things.